Urban One has brightest future in the industry with a best-in-class 31.2% EBITDA Margin and improving industry fundamentals. Urban One's core market, African-Americans, are experiencing improving market fundamentals and expected to play an important role in political elections going forward. The upcoming political race will serve as catalyst for the stock price. Urban One ($UONEK) is a multi-media platform company with a strong market presence and positive cash flow business. Their business primarily consists of their Radio (Radio One) & TV (TV One) segment, that make up roughly 83% of the company’s total revenue. The remaining 17% is composed of digital media revenue from social media platforms and websites. Urban One primary focuses on curating content to the African-American community, which has historically been under-served. We believe the market is undervaluing the potential of Urban One due to the secular headwinds and negative sentiment in the Radio & TV industry, which has depressed their valuation. Additionally, investors are putting to much emphasis on Urban One’s debt load, and under-weighting managements plans to de-lever the company. Urban One has a strong captivity on their end-markets and consumers, through their storied history and this will serve as a major catalyst in the upcoming political elections. Lastly, Urban One has the brightest future in the industry with a best-in-class 31.2% EBITDA Margin and improving industry fundamentals. Yes, we all know that the radio and cable industry have been in a secular decline for quite some time, but that doesn't mean there isn't money to be made. Urban One is one of the most interesting players in the space due to their targeted market: African-Americans. 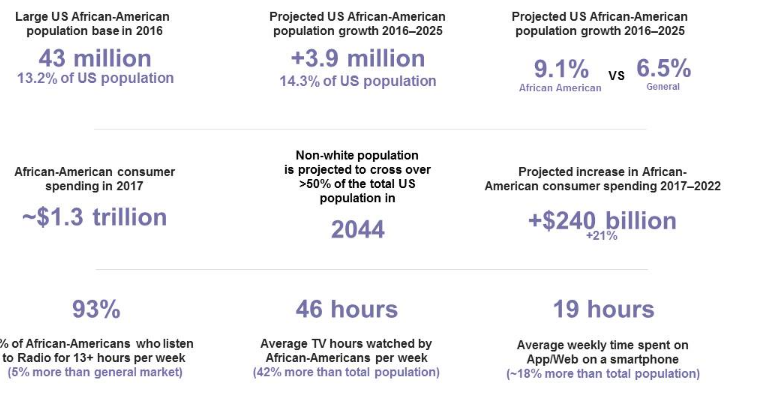 African-Americans are a highly sought-after group when it comes to advertising in radio and cable due to their projected growth and tendencies to listen more to radio and watch more TV on average compared to other demographics. Another key point is that African-Americans play a pivotal role in the political game and with politics becoming more competitive we are going to see Urban One reap the benefits of political advertising by the end of 2020 as candidates gear up for elections. 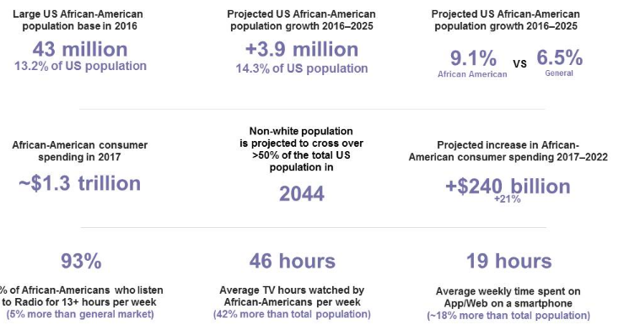 The African-American community not only has compelling market demographics, but there is a huge opportunity for companies as the market is severely undeserved by almost 80% since the number of cable networks for Hispanics is 5x the number of African-American networks. Not only does Urban One have tailwinds in their market demographic and landscape but they have proven to be a leader in their areas of focus. 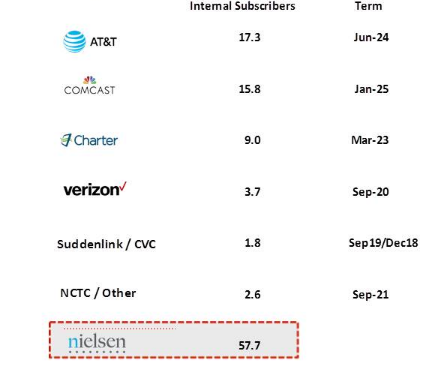 The company derives revenue from two core segments: radio and cable. Urban One operates 59 radio stations, which would normally be classified as mid-tier in size and not enable companies to garner national advertising accounts. However, Urban One has 59 radio stations that are all located in the top 15 African-American markets in the US. Having such a targeted niche and focus allows Urban One to win national advertising contracts, without having to spend money supporting a cast of national radio station accounts. Urban One's has penetrated their target market so effectively that they have been serving national accounts like McDonald's, Pepsi, Chevrolet, etc. for years. Since the company is serving & winning national accounts with a mid-tier size, they can generate a 31.2% EBITDA margin, which is at the top of the industry when compared to peers. 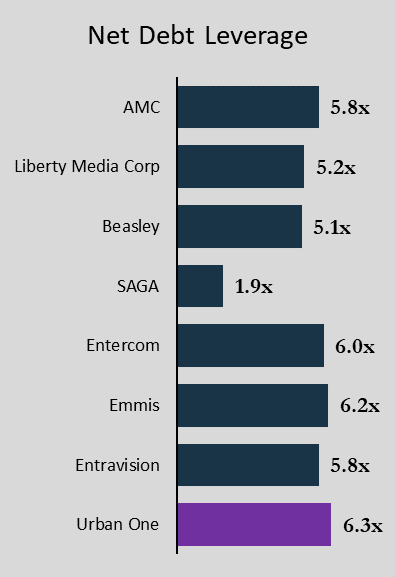 If you analyze the companies above, you will notice that the companies with the best margins, like AMC and MSG, all have a large TV component. 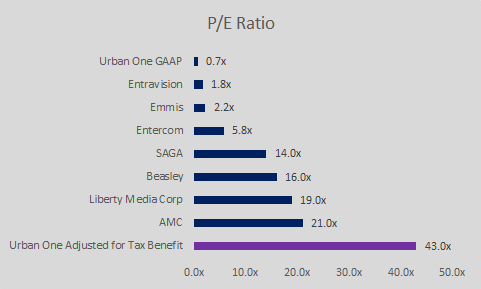 However, Urban One has largely produced these strong margins by operating in the radio industry which has historically produced lower margins, for example Emmis and Entravision are primary radio players and their margins are at the bottom tier. With that being said, we are bullish on Urban One because they are just starting to enter the cable/TV segment and diversifying their revenue and business model. TV One, the operating name of the company's cable/TV segment, has produced critically acclaimed shows and movies. For example, the hit TV Drama show "Empire" and "Unsung" have all been produced by Urban One. Furthermore, TV One has grown quite nicely and contributed nicely to the financials. TV One has also established strategic, long-term partnerships and contracts with other servers and providers to diversify revenue streams and increase content distribution channels. Urban One' strategic partnerships with the listed partners above and early success in the TV industry is being undervalued by the market. Urban One is having great success in the sector due to their ability to produce high-quality content and lack of supply in the market for content that suits the African-American market as stated above. The industry hasn't addressed the issue of an under-served African-American market and competitors haven't jumped into the space, therefore we believe Urban One will continue to dominate the space. Urban One ran into some trouble with both the debt and equity markets in December 2018 when they tried to refinance their ’20 Notes before they became current. While refinancing notes before becoming current makes sense, Urban One could not have picked a worst time to do so. Aside from having a net leverage above the industry average and announcing a refinance right after media giant, iHeart radio filled for bankruptcy, the markets in December were very dry with 0 new HY Bond issuance's. Fortunately, Urban One was able to drum up enough demand to refinance and extend their maturity but at a pricey cost. Additionally, the stock suffered and fell almost 20% from $2.01 to $1.65. With over $900m in debt and a net leverage of 6.3x, Urban One is slightly above the industry average leverage numbers, which became very clear with how the market reacted in December 2018. However, the reason Urban One raised so much debt was to develop their cable network from scratch, which has provided fruitful dividends with expanded margins. 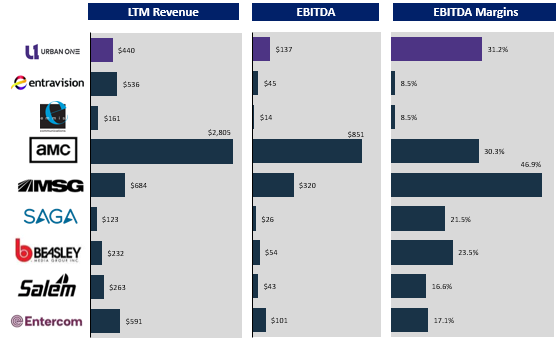 However, even if you forecast 0% revenue growth and EBITDA margins stagnating the the low 30’s for the next 5 years, Urban One has a clear path to delever, with levered FCF totaling $268m or roughly 1/3rd of their capital structure. Additionally, Urban One’s MGM loan will be paid off using the proceeds from the sale of their equity stake in MGM which management has projected be in ’21 for $70m. The Comcast notes will be paid of this year using FCF. Urban One’s Net Debt Leverage has damaged their reputation with investors, especially the mature industry they operate in. When you analyze how Urban One stacks ups against their peers, it becomes clear that they are highly levered. However, there is a clear path, with 0% growth that Urban One will be able to reduce leverage to 5.2x by 2022. Now why does this all matter? Well Urban One’s been hit hard by every industry and company tailwind in the book and they have paid for it. There GAAP reported P/E ratio is 0.7x, but investors have to adjust for the $138.8m tax benefit. Therefore, Urban One's true P/E ratio is actually 43.7x. While a P/E ratio this high might not seem attractive, especially when organic growth is lackluster, the investment thesis behind Urban One is still strong. The company has strong end markets (African-Americas) that are expected to get improve overtime. This will allow Urban One to continue to be profitable, as they where in 2018, and take advantage of their NOL's. With over $700m in NOL's, the company will have the opportunity to pay no taxes for the next 6-7 years, which will allow them to de-lever and increase shareholder value. Note: Urban One's P/E ratio 0.7x is benefited from a $138.8m tax benefit due to the 2016 Tax Cuts and Jobs Acts. Urban One has over $700m in NOL's that are expected to offset profitable income in the coming 6-7 years. However, if we remove this tax benefit the adjusted P/E value becomes 43.7x. Please see note below for more information. Urban One has over $700m in NOLs from historic losses that can be used going forward to offset taxable income. However, the market hasn't really given much value to these NOL's because the company has historically been unprofitable and delivered very little net income, making these NOLs worthless. With that being said, Urban One has produced positive EBIT in 2017 & 2018, but not positive EBT in 2017. Their lack of performance in the past was mainly attributable to their investment in their TV segment that is already up and running. While the company is currently trading at an adjusted P/E ratio of 43x, we believe that the market will start to give Urban One credit for the full value of their NOL's in the coming 6-12 months when they continue their profitable streak. Radio & TV advertising remain the largest reaching platforms of advertising with Radio reaching 93% of the adult population and TV reaching 88% of the population. Therefore, it would make sense for politicians in the coming election to pour money into these marketing channels. Along with the fact that the political tension in America continues to grow, we expect the coming political election to drive ad expenditure and we expect Urban One to benefit from this increased ad spend due to their niche market concentration on the African-American community, which plays an important role in politics. Urban One clearly has a dominant position in the industry and with politics becoming a bigger and more important part of the American life, we see Urban One benefiting greatly from increased ad spending in the coming years. 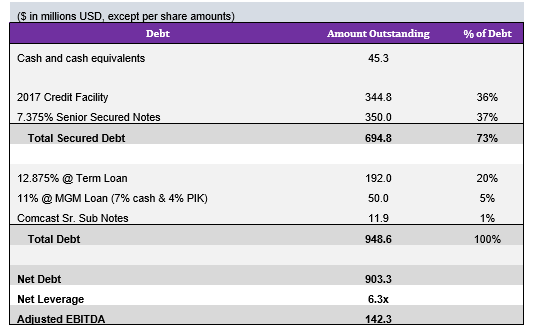 Debt: Urban One's current net leverage is around 6.3x, however, given the CEO and Chairman own 40% of the stock, we believe their interest are align with common shareholders to retire debt. Additionally, Urban One will be able to generate enough Free Cash Flow to pay down the debt. Industry Trends: The radio industry has been losing market share to competitors and alternatives in the industry like digital marketing and social media. Additionally, the TV segment is under pressure from online streaming providers like Netflix & Hulu. Yet, Urban One still has a distinct competitive advantage in their market. Disclosure: I am/we are long UONEK. I wrote this article myself, and it expresses my own opinions. I am not receiving compensation for it (other than from Seeking Alpha). I have no business relationship with any company whose stock is mentioned in this article.